Hofstra Student Life: Left over dining points? Donate to Hurricane Sandy! Left over dining points? Donate to Hurricane Sandy! As the semester winds down to an end, Hofstra University students are taking finals, writing papers, and presenting projects. Although their minds are filled with numbers, words, theories and concepts, students are still finding time to help Hurricane Sandy victims. 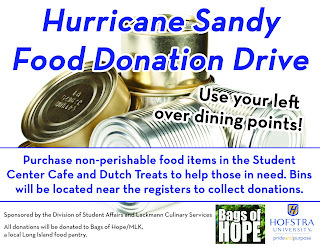 Students can use their left over dining points to buy non-perishable food items in the Student Center Café and in Dutch Treats and then donate those items to the non-profit organization Bags of Hope/MLK. This non-profit has been hard at working collecting items and giving them out to those still in need after the storm last October. 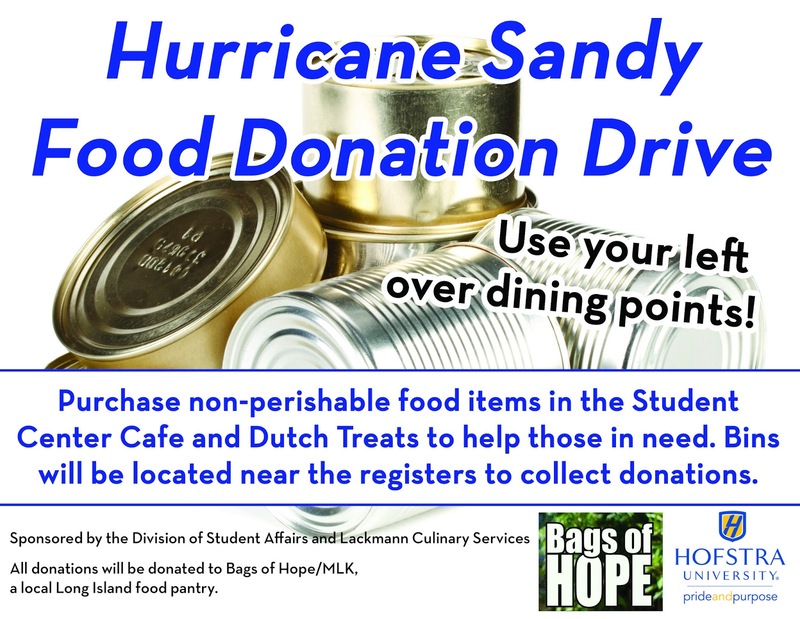 To help out, stop by either the Student Center Café or Dutch Treats and place food into the boxes located at each location. Thank you to all the students whom have already donated, and if you haven’t yet, it isn’t too late! For more information about the food drive and how to donate contact OSLA@hofstra.edu. Keep up that PRIDE Hofstra and best of luck on finals!